…no matter what you call it, it’s just plain FUN ! The Party Bike can be used at resorts, business conferences, birthday parties, wedding parties, as a tourist activity. Why not start a new career and get out there on The elecro Party Bike? The Party Bike is approximately 4,9m feet long, approximately 2,6m feet high and approximately 1,8 m wide. The Party Bike with the electric assist. 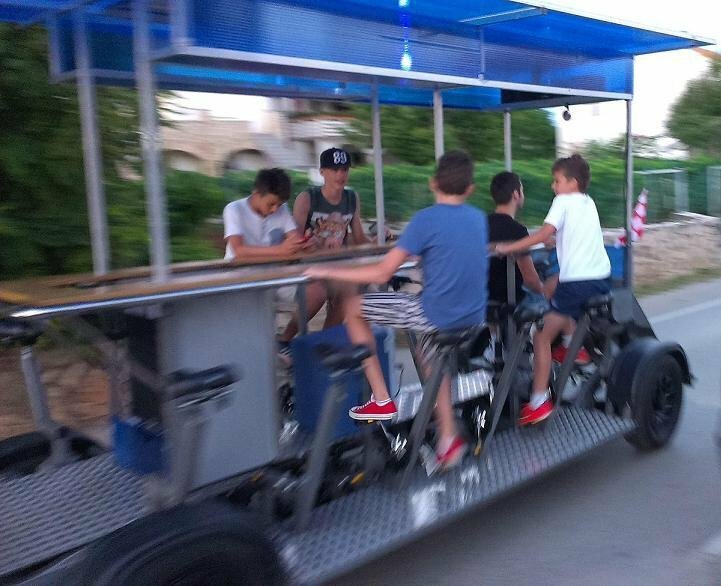 The Party Bike is a group bicycle powered by the pedaling of people. In addition to the pedalers, there is an upholstered seat for non-pedaling guests in the back. There is also room for standing servers on the center catwalk and the driver. And don’t forget the electric assist motor to help on those hills. Electro Pedal bus is one of the 15-passenger human-powered vehicles with electromotors. A total of 15 passengers power the party wagon is as easy as a 10-speed in fourth gear. There is a driver who steers and brakes, a tour guide who serves the guests and room for coolers and beer. Physically, its about the size of a cargo van and travels at an average speed of between 5 and 10 miles per hour. For more information, welcome to contact us . As a 5-year-experienced the bicycle manufacturer from Croatia. Through the hard work from all of experienced employees,our Conference bike, bar bike all have gained high reputation among clients from Europe . superior engineers, machinists, welders, mechanics . Top quality from Europe .